Pink tip anemones, also known as condy anemones and giant Caribbean anemones (Condylactis gigantea), are among the largest anemones available in the aquarium trade. In the wild, they grow to a disk size 16 inches or more, although they're unlikely to reach these dimensions in an aquarium. A large tank is a prerequisite for keeping this species, but otherwise their care requirements are not particularly unusual. Pink tip anemones inhabit the reefs and lagoons of the Caribbean, especially around the Florida Keys. Being fairly antisocial creatures, they never collect in large numbers, although these anemones sometimes are found in scattered groups. When two individuals get too close together, they will fight, so never try to keep more than one in a tank. A large, established reef tank, one of 50 gallons or more, is essential. In this case, “established” means a tank that has been running for several months, not one that’s newly cycled. Because anemones get some of their nutrients from symbiotic algae, high-intensity light is also crucial. 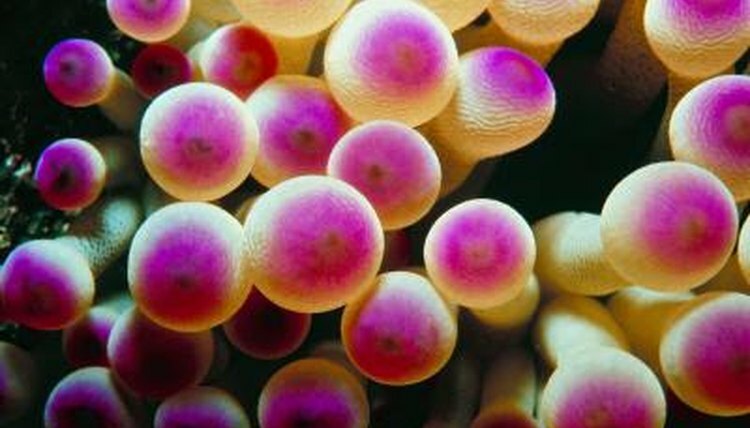 Protect filter intakes, as anemones do move around and can’t withstand being sucked in by currents. Keep the temperature between approximately 72 and 78 degrees Fahrenheit and aim for a fairly high pH: a little over 8. Occasional supplemental iodine may be beneficial. In the wild, the pink tip diet consists of various small fish and invertebrates, including shrimp, mussels and even sea urchins. In captivity, feed your anemone every one to three days on fresh or defrosted frozen fish and shrimp, placing a small chunk above its tentacles. Aquarium forceps come in handy for this task. If the anemone doesn’t ingest a meal, remove the uneaten food and start feeding less frequently. On the other hand, if the tentacles start looking thin and straggly, you probably need to feed more often. An aquarium is not the ideal environment for these anemones; they are unlikely to grow to their maximum size. The biggest you can realistically expect a pink tip to reach in a tank is about 6 inches. Because they are carnivores, they may well catch and consume smaller fish and invertebrates in the tank, especially those lacking any defense, and so they're not ideally suited to a community tank. In turn, some captive creatures may prey on an anemone, notably the scarlet reef hermit crab, also known as the red-legged hermit crab (Paguristes cadenati). Can Starfish Live With Anemones?